Current data-management systems and analysis tools fail to meet scientists’ data-intensive needs. A "data vault" approach lets researchers effectively and efficiently explore and analyze information. Ivanova, M.G, Kersten, M.L, Manegold, S, & Kargin, Y. (2013). 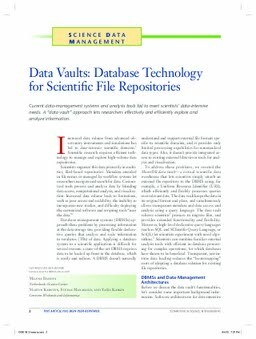 Data Vaults: Database Technology for Scientific File Repositories. Computing in Science and Engineering, 15(3), 32–42.